1.) I wanted you to remind you to remember the most often forgotten items by travelers when they pack. The most common items forgotten when traveling, according to a new poll by Gannett News Corp. Emergency medical insurance incl. medical and political evacuation. Your phone or laptop charger – Finding power at the airport or hotel is always a challenge. Realizing you left your charging cord spells disaster, and missing important calls/texts. Toothbrush – Because you use it the night before so it doesn’t get packed. Recommendation? Always have a second toothbrush packed in your toiletries bag. Umbrella –Even when the forecast looks nice, you know there will be a freak thunderstorm. Prescriptions – Bring enough medication for your entire stay (plus a day or two) to avoid wasting time and costly prescriptions refilled out-of-network or needing to get approval from the doctor’s office while away. Sealed bottles and lower pill counts are better. Liquid prescriptions can often be given to you un-mixed with water from the pharmacist if specifically requested. An extension cord. Either the hotel room never has enough plugs where you need them or your charger is too short to reach the bed or behind a piece of furniture. Don’t rearrange the entire room! Simply throw in a 6 foot multi-prong extension cord! Quick on/quick off, comfortable shoes for the plane and/or shoes for the shower. Here is our recommendation. A plan to combat jet-lag so you don’t lose 2-3 days of your valuable time/trip! Pepto-Bismol if traveling anywhere food or water might be questionable or very different from what you are used to. See our free “Top Three Risks Travel Guide” for more ideas on dealing with this particular issue. See more ideas and travel gear recommendations at Pinterest (even if you don’t have an account!). And here’s some things you can probably leave at home. 2.) The #1 mistake travelers make when packing? About 75% of international travelers will risk their family’s health and their financial well-being this travel season by traveling outside their coverage area-without a plan in place. Why risk $200 or more for an emergency room charge (out-of-network) or much worse if you have a heart attack, when for about $1-2 a day and about five minutes of your time, you can make sure you get the best care possible, in a Western-style hospital, by a qualified, recommended physician? Even if traveling to Ecuador, “out-of-network” from one state to another, or even to a war zone or disaster area like Nepal or Haiti? You know us. 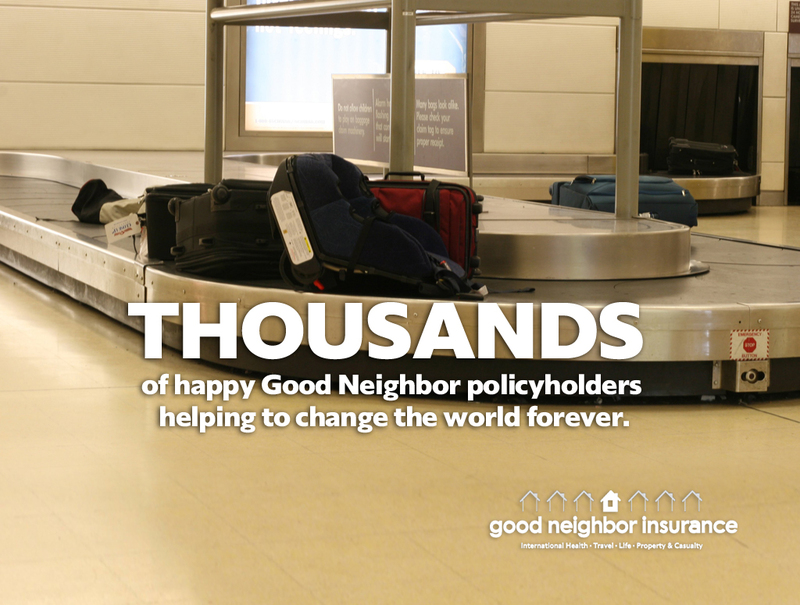 For over 17 years, Good Neighbor Insurance has been committed to keeping you and your loved ones safe. So, please, tell a friend to call us if you know they’ll be traveling. We recommend our best, most chosen short-term insurance plan. For those who travel overseas frequently/more than 3X a year. For older travelers looking for a great rate and coverage for pre-existing conditions. For everything else, give us a call at 866-636-9100 or check out the plans offered on this site, www.gninsurance.com. And don’t forget to tell your family, so they don’t forget either! Thank you for allowing my staff to serve you and yours, and for so many years!